This spring, as many were packing bags for a week of partying at the beach, more than 130 college students were packing their bags for a different kind of vacation – an Alternative Break. 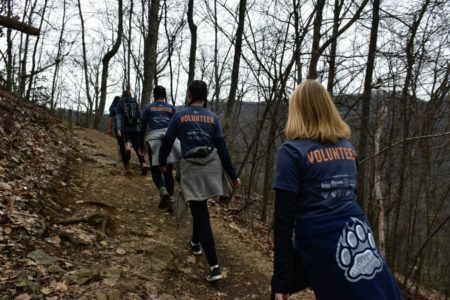 In response to the growing interest in altruist alternatives to the traditional spring break, American Hiking’s Alternative Break Program offers college students outdoor service opportunities in parks and forests across the country. Hailing from 9 different colleges, student groups traveled to four states to help park managers maintain and beautify their trails and facilities in advance of the busy summer season of visitors. 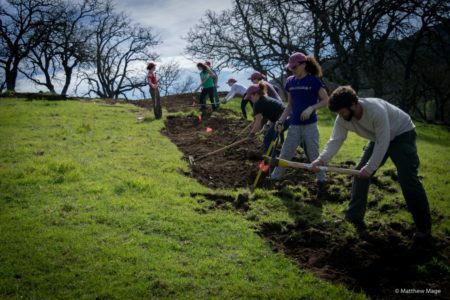 Students from Northeastern University traveled from Massachusetts to California to build new hiking trails in Santa Clara Parks. For many participants, the Alternative Break experience presents rewarding work and the opportunity to grow through new outdoor challenges and situations. A student from Northeastern University commented, “I learned how truly adaptable I can be with new skills and tools, as well as the value of teamwork.” Park staff work side-by-side with the student stewards, teaching them new skills, sharing their own personal experiences, and mentoring those new to outdoor stewardship. Students from the University of New Hampshire head to the work-site. Aiming to keep students engaged and encouraged to participate in the future, park staff make sure it’s not all hard work. Students commented that the most memorable times were going on a guided night “owl calling” hike, practicing archery, gathering at the campfire, and sharing meals with the park rangers. To learn more about the Alternative Break program, visit here.